Abandoned North Shore Motel before demolition in 2008. When the idea first came up in mid-2009 to drive to California and check out the Salton Sea, we were already too late to see the North Shore Motel standing. Site of the North Shore Motel - September 2010. 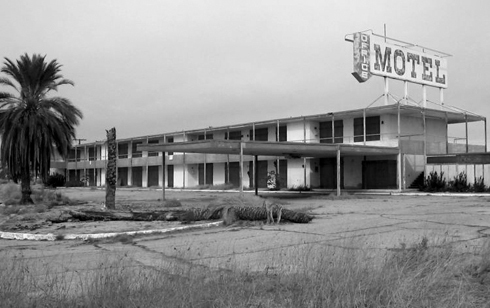 What remains of the motel now is a barren slab of concrete just across the road from the Yacht Club. The area is still hauntingly quiet and full of clues regarding a more promising time. The swimming pool has been filled in with concrete now and the desert brush is reclaiming the parking lot. Still, you can't help but let your mind wander and think about what it all must have been like when the destination was on the up and up. 1963. North Shore Motel in the top left. 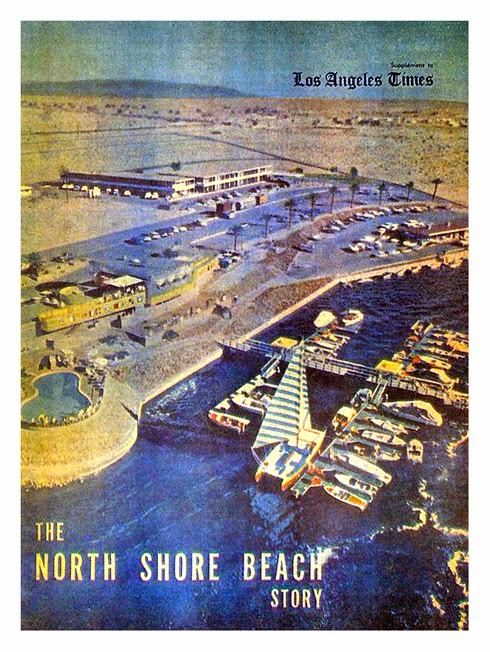 My fascination with the Salton Sea and locations like the Yacht Club and the former North Shore Motel continues to grow the more I learn. The history seems hidden, a novelty of sorts, waiting for some future improvement to give it the proper context. What will become of the Salton Sea isn't exactly clear as there are still major environmental and economic hurtles to overcome if the area is to ever thrive again. However, one thing is for certain. The area remains an incredible place to discover and explore. 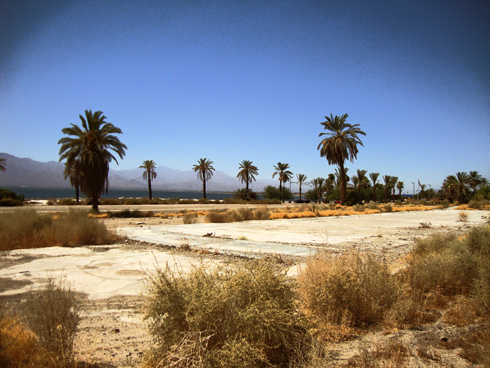 Even with the motel gone, the Salton Sea still lends itself to those looking for an escape. 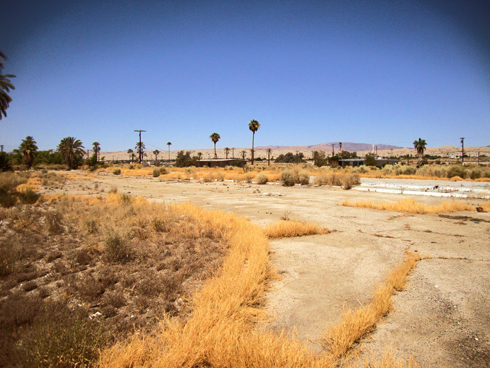 View from the motel to the Salton Sea. 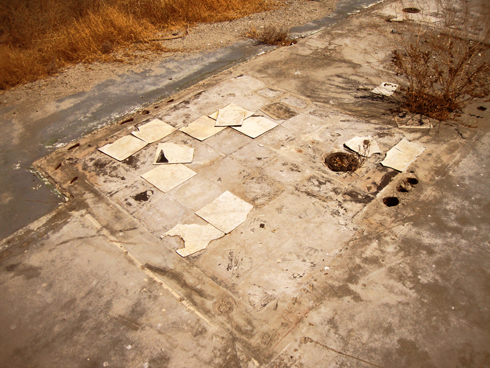 Tiles from one of the bathrooms baking in the sun. 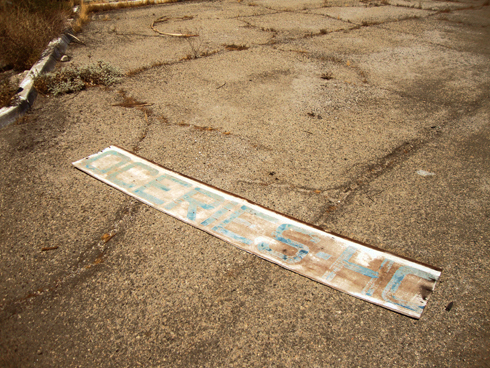 An old grocery sign discarded in the parking lot. 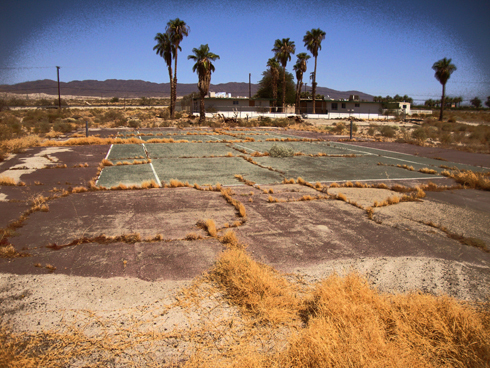 The tennis court having seen better days. Great shots Luke! Love abandoned places. Thanks for sharing I had never heard of it. Great pics Luke. My family always took weekend vacation trips to the Salton Sea when we were kids. I have such fond memories of staying at the North Shore Motel. The pictures you have right before the demolition were exactly as I remembered it. I was just looking at some old pictures of my sisters and I swimming in the pool at the motel. Good times!